White-gloved butlers. Exclusive itineraries. All-inclusive service. Just some of the reasons to choose Scenic for your luxury river cruise. Established in 1987 as an Australian river cruise line and tour operator, Scenic entered the U.S. market in 2008, where it quickly established itself as a leading provider of luxury river cruises. Catering to a niche group of passengers who enjoy high-class service as well as cultural immersion and adventure, Scenic successfully balances destination-oriented cruising with a self-proclaimed six-star level of onboard service. Looking for long stays in landmark cities, creative and flexible onshore itineraries, and a worry-free, all-inclusive experience? Look no further than a Scenic river cruise. The Scenic fleet consists of 15 luxurious "space ships," or river boats, named so for their exceptionally-roomy staterooms. Each ship features a variety of fine dining options, luxurious accommodation, and free WiFi onboard. In 2018 Scenic built its first luxury ocean yacht, the Scenic Eclipse. Built to withstand cool temperatures and icy waters, the Eclipse will sail to the ends of the Earth, visiting the Arctic, Antarctica, and majestic fjords. Experience the wonders of Myanmar's Irrawaddy River on the luxurious Scenic Aura. Indulge in inspired Asian cuisine, the attention of a personal butler, and unforgettable onshore experiences - at an all-inclusive price. The self-styled "World's First Discovery Yacht," the Scenic Eclipse is a six-star luxury yacht that represents Scenic's first foray into ocean cruising. This unprecedented luxury ship features two helicopters, a fleet of small craft exploration vessels, kayaks, e-bikes, and a seven-person submarine for passengers' pleasure. The Scenic Amber is one of the most spacious, most luxurious, and most technologically advanced river vessels in Europe. 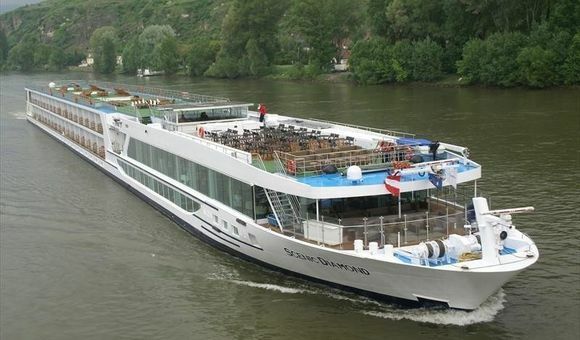 Set sail with her on a romantic cruise along the river Danube. Joining its sister “discovery yacht” in 2020, the Scenic Eclipse II will undertake exciting expedition voyages to and around the Arctic. Designed by a cruise line known for its “six star service,” Scenic Eclipse II will bring an unprecedented level of luxury to expedition cruises.